Nail anatomy terminology is confused and there is no shortage of competing ideas and not much clarity. Everyone seems to be confused about the names for the parts of the natural nail, even doctors and scientists aren’t sure which terms to use. Misinformation is abundant, so it can be very difficult to know the facts, but the facts are what we need. I’ve been working behind the scenes with many of the top nail educators in the world to address this problem, for indeed it is a global problem. In doing so, I created the original version of the drawing above and based it on a strict interpretation of the medical definitions. I shared that first version with many people, including world-class scientists, dermatologists, podiatrists and pathologists. Of course, I heard many different opinions, but I was looking for hard facts and would accept nothing less. As a result, I was eventually directed to conclusive evidence that brings great clarity and finally settles a long-standing debate about the eponychium, cuticle and proximal nail fold. Here is what I’ve learned. The “eponychium” is defined in medical literature as the skin that covers the nail matrix and is responsible for development of the cuticle tissue that adheres to the top of the nail plate. 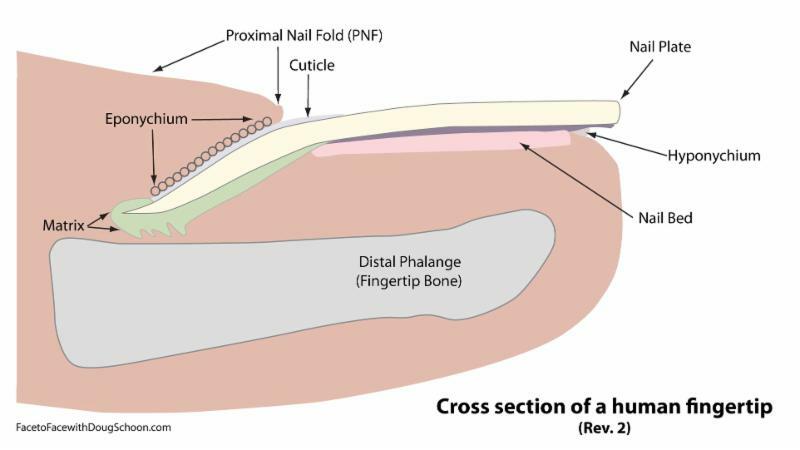 The proximal nail fold is defined as the fold of skin at the base of the nail plate. That much is clear, but here is the Eponychium’s Dilemma- where does one end and the other begin? At last, researchers have answered this question definitively by isolating and identifying the cuticle forming area. It was discovered that the eponychium is a much thinner layer than suspected- in fact it is surprisingly thin- approximately 0.1-0.15 mm thick or about 0.004-006 inches thick! Rather amazingly, all nail cuticle tissue comes from this thin layer of cells. How can such a surprisingly thin area make all that cuticle tissue? The prevailing thought is that the eponychium must be made of a specialized type of cell called an “adult stem cell”. The same type of stem cells are suspected to form the nail matrix and produce nail plate cells. Research is underway to verify that both the eponychium and nail matrix are composed of adult stem cells which behave like factories to produce nail plates and cuticles. One insightful description I heard was that the proximal nail fold should be viewed as a “flap” of skin that covers the matrix area and its underside is thinly covered by the eponychium. I think that paints a good picture. So, in short, the eponychium creates and releases the cuticle, which is the thin layer of dead tissue that will ride the nail plate and form a seal that prevents pathogens from entering and infecting the matrix area. This should tissue should NOT be confused with the eponychium or the proximal nail fold. They are each very different. If you want to learn more fun, interesting and useful information about the nail and nail products, you’ll love my new book, “Face-to-Face with Doug Schoon” Volume 1. Follow Doug Schoon’s Brain on Facebook to be the first to know when Volume 2 is released with in depth natural nail information!